Who Can Do It - and How? F or foreigners, buying real estate in Mexico might seem like an impossible dream. It seems that "everyone knows" that foreigners aren't allowed to buy property in Mexico. "Everyone knows" that if you do, you're likely to have it taken away by the government. This idea had some basis in truth in the past. After the Revolution, the 1917 constitution prohibited foreigners from owning real estate in Mexico. 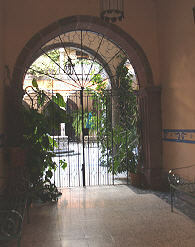 Eventually, ways to get around the law were devised—including the "bank trust" that many early ex-pats used to buy a home in San Miguel de Allende. In 1994, during the Salinas de Gortari administration, the Mexican constitution was changed. The law now allows foreign nationals to buy property in Mexico in their own names and with their own deeds. For expatriates, direct ownership of real estate in Mexico was back on the table. If you die in Mexico, your property will be given to the University of Guanajuato! 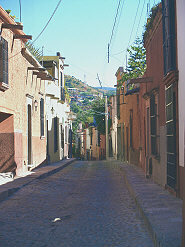 In San Miguel de Allende, none of these myths of buying Mexico real estate is true. So what is the truth? Who can and can't buy Mexican property and how do you do it? This is land that can not be owned by anyone, Mexican or foreigner. It includes all beachfront land running from the mean high tide line (the point where high tide hits the sand or rocks averaged out over a year) to 20 meters (approx. 60 feet) up the beach. This land belongs to the federal government and the people of Mexico and can never be sold. Access to this strip of Federal Zone land can't be cut off by anyone either, even those resorts or homeowners owning the beachfront property immediately above the Federal Zone—much as they might like to close it off for their private use. So you are free to go walk on the beach anywhere in Mexico! The Restricted Zone encompasses all beachfront property in Mexico. Anything from the 20 meter Federal Zone boundary inland to 50 kilometers (approximately 30 miles) is Restricted. The Zone also covers all land within 100 kilometers (approximately 60 miles) from an international border. Within this zone, Mexican nationals can buy Mexican property outright, but foreigners may not. The laws against foreigners owning land in this zone provide the seed of truth that fuels the myths about buying real estate in Mexico. Recent changes in the law have created a way for foreigners to "buy" this Mexican real estate. They do this with a legal instrument called a fideicomiso or bank trust. With a fideicomiso, foreigners who have property in the Restricted Zone have the power and right to rent, lease, or subdivide it, build on or improve it, transfer ownership to another (i.e. sell it), and will it to their children or other heirs. The actual title rests with the bank, but practically speaking, the homeowner has all the rights of ownership. Ejidos are communal lands. The idea grew out of the Revolution and was instituted by the government of President Lázaro Cárdenas in 1934 as part of important land reform programs. Basically, it was a way for Mexican peasants, the ejidatarios,to finally have rights to the land they worked instead of being serfs or tenant farmers. The administration of the ejido lands is done by the community. Other Salinas legislation in 1991 changed the laws concerning ejidos. It's now possible for them to be converted to private property, which then can become subject to sale like any other property. However, converting ejido land to private property is a very long and complicated process involving the will of the community, boundary disputes, family conflicts and pending litigation. All ejido members must agree to re-classify the land. It is not uncommon for ejidatarios or developers to offer this Mexican land for sale with a promise that the "privatization" is in process and a clear title will be available in a matter of months or years. Sometimes it even happens. Frequently it does not. Some foreigners have "purchased" ex-ejido lands only to discover months or years later that they had no title to their land—and no legal rights to it. The Bottom line: Do not buy ejido land unless and until you have definitive proof that it has been converted to private property with a clear title that can legally be passed on to you. We know what the Federal Zone, Restricted Zone and Ejido lands are. The Unrestricted Zone is everything else. All of Mexico that lies more than 50 kilometers from the beach or 100 kilometers from the border is "open to buy." Anyone, Mexican or foreigner, can buy land in Mexico in the Unrestricted Zone and own it outright, exactly as you would do at home in the U.S., Canada or most other countries. This is the easiest Mexico real estate to purchase. Certainly, there are challenges to buying real estate in Mexico. The laws are different from what you are used to and, like everything in Mexico, the rules are open to interpretation. It is imperative that you consult a real estate professional or lawyer to help you navigate the shoals of buying Mexican real estate. But buying a house in San Miguel de Allende is not only legally possible, it is a joyous way to put down roots in your new home town. Choosing your perfect house in San Miguel, furnishing and decorating it, planting a garden, filling it with your new life—making it yours—is an important step in making San Miguel de Allende your home. Your own little piece of heaven—your real estate in Mexico—is definitely within reach.